Well, I finally did it! I've completed my very first TAS and it's of one of my favourite NES games. It took some time getting used to the physics and coming up with some of the strategies but I'm really happy with the way this turned out. I'm definitely looking forward to making more TASes. Balloon Fight is a classic NES game first released in 1984 and programmed by the late Satoru Iwata. It was first released in arcades and was later ported to the NES. 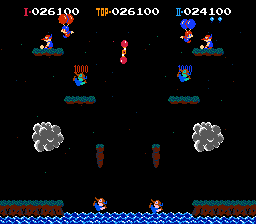 The NES version came with a new mode called Balloon Trip and had some drastic level changes. This TAS makes use of the 2 player mode to complete the game as quick as possible. 2 Player Game allows two people to take control of balloon fighters to complete levels together and to compete for points. This makes for some interesting and otherwise impossible strategies to complete levels as quick as possible. Some bouncing strats may occur. NOTE: I only complete up to Phase 12 because all the stages after that repeat. This is similar to other arcade Nintendo games likes Donkey Kong, Mario Bros., etc. There is not much to do in the bonus stages so I just mess around until the last 4-5 balloons appear. There are 20 balloons total and popping the last 4-5 speeds up the end and brings you to the results screen quicker. 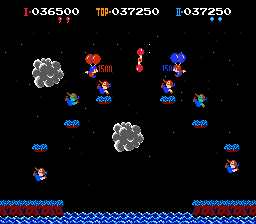 This works because when the last balloons on screen get collected quickly (almost as they spawn), no balloons have to rise to the top thus ending the bonus game. Yup, not much to say here. Things already start to get tricky. I wait for 1P to pass before making 2P rise or else they collide and ruin the strategy. Here I abuse the bouncing physics to kill the birds near the top quicker. Not much to say here. Pretty simple strategy. In this phase, the birds on the pillars can actually be killed much lower than intended. Having the top of your balloons near their feet will almost always kill them making it look like they weren't even touched! I combine this with some bouncing and complete the phase pretty quickly. Similar idea to 5, killing birds lower then bouncing to keep momentum. Yes, I finally get to use a flipper to complete a room! When a flipper is vertical or horizontal, hitting it on a certain side will send you in a specific direction. It's hard to control where you go sometimes and it takes a lot of trial and error. Here, I get the flipper to propel P1 upwards to get to the eastern birds quicker. Here, I make P1 and 2 bounce off of each other to keep momentum because the spot is too tight for them both to fit. Same as phase 4 but I instead delay killing the bird to manipulate Bonus 2 to be able to finish it quicker. This was horrible. HORRIBLE. Trying to optimize the flipper propulsion and whatnot was annoying. Damn flippers. This may look like a walk in the park, but this was a little troublesome to optimize. It was not quick enough for both P1 and 2 to get up to the platforms on their sides from the left/right so I had to make them squeeze through the platforms so they could reach them. ars4326: Updated movie file. New time: 02:39:87 (9608 frames). ars4326: Updated movie file. New time: 02:39:62 (9593 frames). ars4326: Hello, Weegeechan. Congrats on completing your first run! Going back and improving on all of Takanawa's times (as well as tightening yours even further) was also respectable and indicative of a good attitude. The main stages were done remarkably fast and the bonus stages had a good dose of entertainment value, as well. All in all, very nice work here.